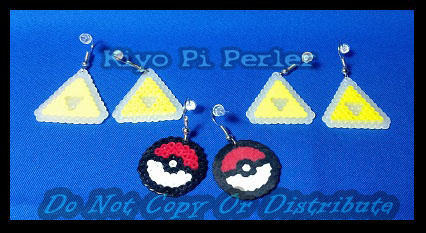 Tri-ball Earrings - So was trying to think of something new with the mini-perlers and I thought why not give our pierced brothers and sisters some love... here's some of the gamer earrings I'll have ready at the next cons I attend. (^__^) Original concept, though the patterns are super basic so can't really claim for those even though I did them free hand with no ref. lol They are about the size of a Nickle (slightly smaller than a quarter) and are near weightless. Will be working on a few more ideas but if you are interested in a custom I am thinking like $10 ~ $20 depending on complexity and $5 for shipping.